Just when we thought baseball bid its last good-bye to our player-son, it beckoned him back with a nomination for the Colorado Springs All-Star game. A couple weeks prior, we absorbed every minute of what we thought was his last game – savored his last hit, memorized the smack of the ball in his catcher’s glove, lost ourselves in the glee of seniors celebrating a last win. Through the years, baseball kept us company in the journey of raising our son: a generous companion, it afforded us friendships to last a lifetime, it ground and filed our son’s character. Baseball also exacted a price. We expended countless weekends, traveled great distances, paid tournament fees, and purchased more gear than we can remember. We endured anxiety through injuries, including watching helplessly as an ambulance drove out on the in-field to carry our son away. And a night when a coach called from another state and reported our son received a concussion during the game. When the coach asked him to identify his whereabouts, his reply: “I’ll have to get back to you on that one, Coach.” We wondered through many a sleepless night if our son’s dream of playing college ball would come to fruition, then careened around a u-turn as he recently and suddenly realized it wasn’t his dream after all. Just when we thought it was over, the All Star nomination offered one last rendezvous. On a beautiful sunny spring day, with thunderstorms skirting the fields, cooling the air but never stopping to visit, our son took the field of the Sky Sox Stadium. He offered his trademark gifs to the game – unflagging encouragement of team mates, centering presence at home plate calling and directing the infield, floppy grin that constantly overflows. There was really nothing to gain: no scouts looking on, no pennants to win. He played for sheer love of the game. And then, as if baseball couldn’t help but affirm what it most loves to receive, it exploded in a burst of generosity. The crack of a bat sent a ball high and up, up in a steady sure arch. In split seconds, the eye of the spectator gauged distance from home plate to descending ball, evaluated the sprint necessary for the catcher, deemed it heroic. And then the catcher materialized at the backstop, as if unfettered from normal physical laws of movement through space; and still it was uncertain which side of the net the ball would fall. Spectators cowered; and then the catcher sprawled, mitt extended, smashing into the backstop. From the dirt, dazed, he held up his glove for all to see, cradling that little white ball like a fragile egg. 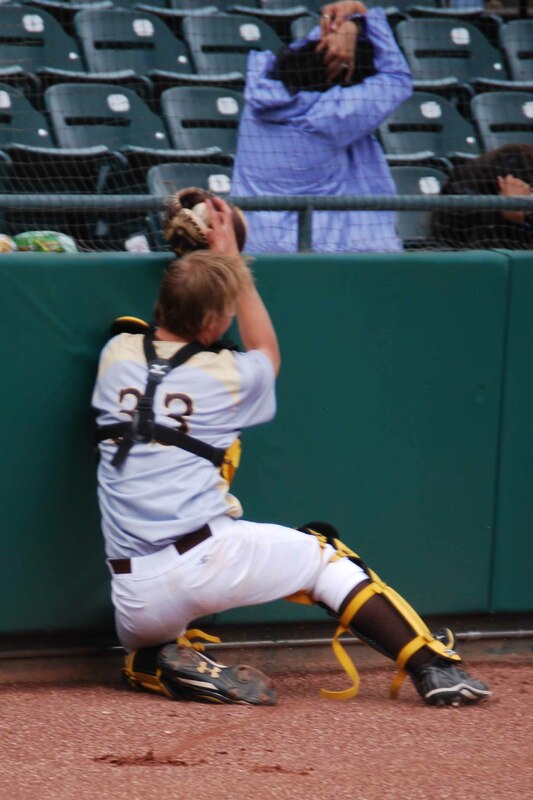 As I reflect on all our baseball experiences piled up in one vibrant heap, it’s that last catch that stands triumphant on the peak, and epitomizes all our son’s baseball journey means to me. Through it all, he offered himself unselfishly, and baseball couldn’t help but honor him in the end. That made my morning. 🙂 Beautiful. Thank you! It was a most unexpected happy gift!